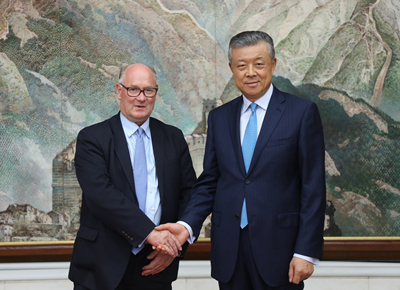 On July 18, Ambassador Liu Xiaoming met at the Chinese Embassy with Sir Douglas Flint CBE, the UK Treasury's Belt and Road Envoy and former Chairman of HSBC Group, and exchanged views with him on China-UK cooperation on the Belt and Road Initiative (BRI). Ambassador Liu noted that since the BRI was proposed five years ago, following the principles of extensive consultation, joint contribution and shared benefit, China and other countries along the Belt and Road have achieved fruitful results and brought tangible benefits to the people of the countries concerned. Due to Britain’s unique strength in finance and legal services, China-UK cooperation on the BRI is mutually beneficial with broad prospects. The Ambassador expressed the hope that the two countries would seize the opportunities to continue to strengthen cooperation, explore the third-party market to further promote a steady China-UK cooperation on the BRI. Ambassador Liu commended Sir Douglas on his effort in actively promoting the BRI in the UK since becoming the Belt and Road Envoy, and hoped that he would continue to share his advice and suggestions on China-UK cooperation on the Belt and Road Initiative. Sir Douglas said that, China and the UK are “natural partners” on the BRI. The UK is optimistic about the great potential of the BRI, and the British people from all sectors are enthusiastic about participating in the Initiative. He spoke of his honour at becoming a member of the Advisory Council of the Belt and Road Forum for International Cooperation and said he would continue to work for China-UK BRI cooperation.